One of the precepts that old jazz pros have taught young musicians for years is that it’s vital to be able to play any piece of music in any key at any tempo. Here’s an example. 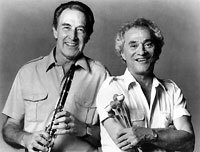 It’s from the days a quarter of a century ago when vibraharpist Terry Gibbs and clarinetist Buddy DeFranco teamed up and toured extensively. Their rhythm section at a club called the Cliff Side in Yokohama, Japan, in 1991 was Larry Novak, piano; Herb Ellis, guitar; Milt Hinton, bass; and Butch Miles, drums. Mr. Gibbs makes the introduction. Stan Getz, with Al Haig on piano, Stan Levey on drums, and Gene Ramey on bass, recorded “Crazy Chords,” a blues in all twelve keys, back in 1949. Many musicians have had fun facing the challenge; Tom Harrell, for instance, as noted here in 2012. Rob McConnell used to talk about his frustration with “jazz studies” students/players who could not even begin to play “Crazy Chords.” But, of course RMc went further and said that jazz studies students who were “real players” ought to be able to play (1) any tune in any key and (2) improvise on any tune in any key. Not much room for compromise there!